Note that at around 6 minutes 40 seconds, Dr. Ingraffea discusses how Chesapeake has the highest rate of violations of any gas operator (in Pennsylvania)...even though it holds itself up as a "paragon of excellence." Earthquakes discussed beginning around 11:00 Minutes: Dr. Ingraffea discusses where there "shall be places that you can not drill...we don't want wells going under schools..."
Click Here to view the Q&A Portion of the Lecture. West Carpo, Well 3H on Matthew Road was fracked beginning last Thursday March 10, 2011 according to the GP Shale Gas Drilling Spreadsheet. Trees have been coming down over that way as well. Probably for the extension of Lakridge Parkway. What a MESS! Just as a reminder, a big chunk of this Lease is located on District 6 City Councilman Ron Jensen's property. The fracking last week must have been horrible for nearby neighbors. But we didn't get a picture of it. Probably looked a lot like this. We note that a house is up for sale within a few feet of the pad site on Matthew Road. We'll see how that goes. Oh, and it looks like there's a non-odorized gas gathering pipeline there (according to the Maps on the RRC Website). So, probably won't be any flowback/flaring. But we're just going by the maps. Stay tuned. This. Is. Just. A Nightmare. We now have the transcript from the February 1st, 2011 Barnes Assembly A Rule 37 Hearing on that horrible day of ice and snow, Our Trailwood neighbors (along with Mr. Louis McBee of the North Central Texas Communities Alliance) made it to Austin and were amazing. The transcript documents an incredibly dramatic hearing!...coming very soon. Click Here to fill out this form immediately!! Our property rights are in serious danger if this bill makes it into our Texas state law. All you have to do is fill in your zip code. The form will do the rest. Or you can personalize it if you wish. We're trying to get to 10,000 signatures. So, please take a few seconds to do this, NOW! Thank you! Just Say NO to Texas Senate Bill 875 introduced by Senator Troy Fraser!! A permit -- for gas drilling, or anything else -- is supposed to make the permit-holder behave responsibly. SB 875 turns that on its head – it makes a permit a “get out of jail free” card. No matter what the gas driller (or other permit holder) does -- if they’re holding a government permit, they can’t be held accountable under Texas nuisance law. If SB 875 becomes law, that is. Tell the members of the Texas Senate Natural Resources Committee: protect our property rights, oppose SB 875! Let's Just Relax and Enjoy Our Flare. The worker appears to be a bit wobbly. Hopefully, it's not from inhaling the fumes since he's clearly not wearing any breathing gear. This shale gas well flaring event was captured in the early morning hours of March 4, 2011 (it was very windy). A worker can be seen walking (sleepily or wobbily) toward the incinerator. The worker is wearing a hard hat, but no breathing gear. We worry about his safety (and our neighbors residing 537 ft. from this flaring)! We have been told (on good authority) that this is one of only three incinerator flaring units of its kind in the world!! We're very lucky ~ but mostly our neighbors on Westchester's Donnie Lane are extremely lucky...you see, most did not choose to sign mineral leases and this flaring event is practically in their back yards. Just a reminder ~ that the whole purpose for the 1,000 foot "setback" from protected use property [**Protected Use means a residence, religious institution, public building, hospital/medical building, nursing home, school or public park. **] (as proposed by the Environmental Services Department) was to protect the citizens from the industrial zone that is shale gas drilling. Citizens include "children." Oh, well. It's a done deal. Whatever Chesapeake Wants. Chesapeake Gets. It's truly amazing how little concern there appears to be about protecting the children of Grand Prairie from shale gas drilling industrial zones. 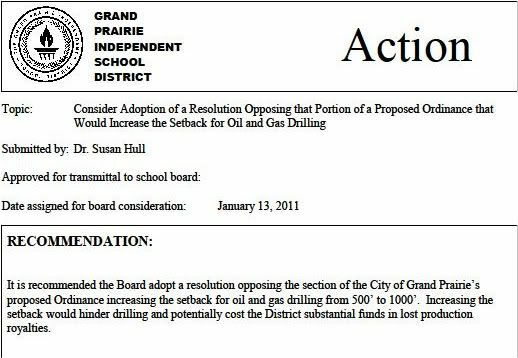 Does the Grand Prairie, TX School Board Really Care About Our Children and Grandchildren? We Have Very Serious Doubts They Do. 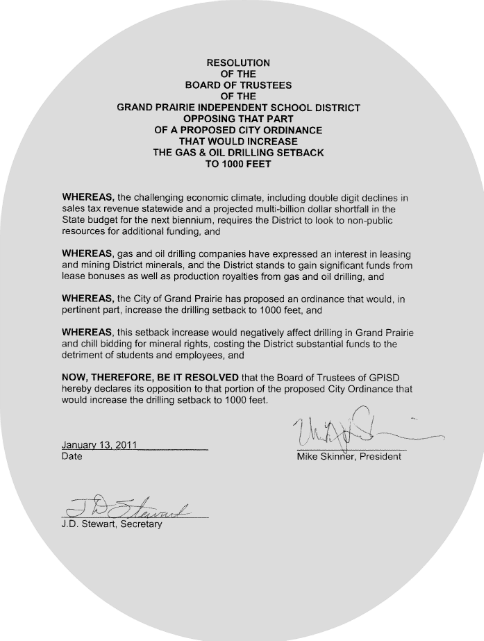 The Document signed by Board President, Mike Skinner and Board Secretary, J.D. Stewart. Oh, so they're an "Alliance"??? How many things can you count wrong with this video? She lost me with hello "we all know it." So, ANGA, what about the darn PROCESS for extracting all this "natural" gas from the shale? Huh? What about that, America's Natural Gas Alliance?? What about turning communities into Industrial Zones in order to get to that so-called clean-burning fossil fuel? What about that, America's Natural Gas Alliance? This is crazy. Good grief!! God. Help Us. Please.